The graphical user interface (GUI /ˈɡuːi/) is a form of user interface that allows users to interact with electronic devices through graphical icons and visual indicators such as secondary notation, instead of text-based user interfaces, typed command labels or text navigation. GUIs were introduced in reaction to the perceived steep learning curve of command-line interfaces (CLIs), which require commands to be typed on a computer keyboard. The actions in a GUI are usually performed through direct manipulation of the graphical elements. [better source needed] Beyond computers, GUIs are used in many handheld mobile devices such as MP3 players, portable media players, gaming devices, smartphones and smaller household, office and industrial controls. The term GUI tends not to be applied to other lower-display resolution types of interfaces, such as video games (where head-up display (HUD) is preferred), or not including flat screens, like volumetric displays because the term is restricted to the scope of two-dimensional display screens able to describe generic information, in the tradition of the computer science research at the Xerox Palo Alto Research Center. 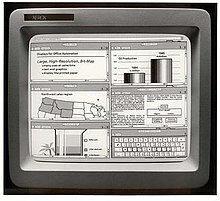 The graphical user interface is presented (displayed) on the computer screen. It is the result of processed user input and usually the main interface for human-machine interaction. The touch user interfaces popular on small mobile devices are an overlay of the visual output to the visual input. Designing the visual composition and temporal behavior of a GUI is an important part of software application programming in the area of human–computer interaction. Its goal is to enhance the efficiency and ease of use for the underlying logical design of a stored program, a design discipline named usability. Methods of user-centered design are used to ensure that the visual language introduced in the design is well-tailored to the tasks. The visible graphical interface features of an application are sometimes referred to as chrome or GUI (pronounced gooey). Typically, users interact with information by manipulating visual widgets that allow for interactions appropriate to the kind of data they hold. The widgets of a well-designed interface are selected to support the actions necessary to achieve the goals of users. A model–view–controller allows flexible structures in which the interface is independent from and indirectly linked to application functions, so the GUI can be customized easily. This allows users to select or design a different skin at will, and eases the designer's work to change the interface as user needs evolve. Good user interface design relates to users more, and to system architecture less. A GUI may be designed for the requirements of a vertical market as application-specific graphical user interfaces. Examples include automated teller machines (ATM), point of sale (POS) touchscreens at restaurants, self-service checkouts used in a retail store, airline self-ticketing and check-in, information kiosks in a public space, like a train station or a museum, and monitors or control screens in an embedded industrial application which employ a real-time operating system (RTOS). By the 1980s, cell phones and handheld game systems also employed application specific touchscreen GUIs. Newer automobiles use GUIs in their navigation systems and multimedia centers, or navigation multimedia center combinations. A GUI uses a combination of technologies and devices to provide a platform that users can interact with, for the tasks of gathering and producing information. A series of elements conforming a visual language have evolved to represent information stored in computers. This makes it easier for people with few computer skills to work with and use computer software. The most common combination of such elements in GUIs is the windows, icons, menus, pointer (WIMP) paradigm, especially in personal computers. The WIMP style of interaction uses a virtual input device to represent the position of a pointing device, most often a mouse, and presents information organized in windows and represented with icons. Available commands are compiled together in menus, and actions are performed making gestures with the pointing device. 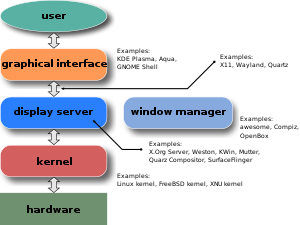 A window manager facilitates the interactions between windows, applications, and the windowing system. The windowing system handles hardware devices such as pointing devices, graphics hardware, and positioning of the pointer. 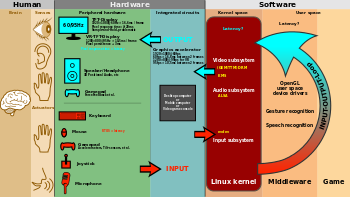 In personal computers, all these elements are modeled through a desktop metaphor to produce a simulation called a desktop environment in which the display represents a desktop, on which documents and folders of documents can be placed. Window managers and other software combine to simulate the desktop environment with varying degrees of realism. Smaller mobile devices such as personal digital assistants (PDAs) and smartphones typically use the WIMP elements with different unifying metaphors, due to constraints in space and available input devices. Applications for which WIMP is not well suited may use newer interaction techniques, collectively termed post-WIMP user interfaces. As of 2011, some touchscreen-based operating systems such as Apple's iOS (iPhone) and Android use the class of GUIs named post-WIMP. These support styles of interaction using more than one finger in contact with a display, which allows actions such as pinching and rotating, which are unsupported by one pointer and mouse. Human interface devices, for the efficient interaction with a GUI include a computer keyboard, especially used together with keyboard shortcuts, pointing devices for the cursor (or rather pointer) control: mouse, pointing stick, touchpad, trackball, joystick, virtual keyboards, and head-up displays (translucent information devices at the eye level). There are also actions performed by programs that affect the GUI. For example, there are components like inotify or D-Bus to facilitate communication between computer programs. Ivan Sutherland developed Sketchpad in 1963, widely held as the first graphical computer-aided design program. It used a light pen to create and manipulate objects in engineering drawings in realtime with coordinated graphics. In the late 1960s, researchers at the Stanford Research Institute, led by Douglas Engelbart, developed the On-Line System (NLS), which used text-based hyperlinks manipulated with a then new device: the mouse. In the 1970s, Engelbart's ideas were further refined and extended to graphics by researchers at Xerox PARC and specifically Alan Kay, who went beyond text-based hyperlinks and used a GUI as the main interface for the Smalltalk programming language, which ran on the Xerox Alto computer, released in 1973. Most modern general-purpose GUIs are derived from this system. The Xerox PARC user interface consisted of graphical elements such as windows, menus, radio buttons, and check boxes. The concept of icons was later introduced by David Canfield Smith, who had written a thesis on the subject under the guidance of Kay. The PARC user interface employs a pointing device along with a keyboard. These aspects can be emphasized by using the alternative term and acronym for windows, icons, menus, pointing device (WIMP). This effort culminated in the 1973 Xerox Alto, the first computer with a GUI, though the system never reached commercial production. The first commercially available computer with a GUI was the 1979 PERQ workstation, manufactured by Three Rivers Computer Corporation. Its design was heavily influenced by the work at Xerox PARC. In 1981, Xerox eventually commercialized the Alto in the form of a new and enhanced system – the Xerox 8010 Information System – more commonly known as the Xerox Star. These early systems spurred many other GUI efforts, including Lisp machines by Symbolics and other manufacturers, the Apple Lisa (which presented the concept of menu bar and window controls) in 1983, the Apple Macintosh 128K in 1984, and the Atari ST with Digital Research's GEM, and Commodore Amiga in 1985. Visi On was released in 1983 for the IBM PC compatible computers, but was never popular due to its high hardware demands. Nevertheless, it was a crucial influence on the contemporary development of Microsoft Windows. Apple, Digital Research, IBM and Microsoft used many of Xerox's ideas to develop products, and IBM's Common User Access specifications formed the basis of the user interfaces used in Microsoft Windows, IBM OS/2 Presentation Manager, and the Unix Motif toolkit and window manager. These ideas evolved to create the interface found in current versions of Microsoft Windows, and in various desktop environments for Unix-like operating systems, such as macOS and Linux. Thus most current GUIs have largely common idioms. GUIs were a hot topic in the early 1980s. The Apple Lisa was released in 1983, and various windowing systems existed for DOS operating systems (including PC GEM and PC/GEOS). Individual applications for many platforms presented their own GUI variants. Despite the GUIs advantages, many reviewers questioned the value of the entire concept, citing hardware limits, and problems in finding compatible software. In 1984, Apple released a television commercial which introduced the Apple Macintosh during the telecast of Super Bowl XVIII by CBS, with allusions to George Orwell's noted novel Nineteen Eighty-Four. 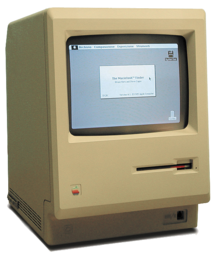 The goal of the commercial was to make people think about computers, identifying the user-friendly interface as a personal computer which departed from prior business-oriented systems, and becoming a signature representation of Apple products. Accompanied by an extensive marketing campaign, Windows 95 was a major success in the marketplace at launch and shortly became the most popular desktop operating system. In 2007, with the iPhone and later in 2010 with the introduction of the iPad, Apple popularized the post-WIMP style of interaction for multi-touch screens, and those devices were considered to be milestones in the development of mobile devices. The GUIs familiar to most people as of the mid-late 2010s are Microsoft Windows, macOS, and the X Window System interfaces for desktop and laptop computers, and Android, Apple's iOS, Symbian, BlackBerry OS, Windows Phone/Windows 10 Mobile, Tizen, Palm OS-WebOS, and Firefox OS for handheld (smartphone) devices. Since the commands available in command line interfaces can be many, complex operations can be performed using a short sequence of words and symbols. This allows greater efficiency and productivity once many commands are learned, but reaching this level takes some time because the command words may not be easily discoverable or mnemonic. Also, using the command line can become slow and error-prone when users must enter long commands comprising many parameters or several different filenames at once. However, windows, icons, menus, pointer (WIMP) interfaces present users with many widgets that represent and can trigger some of the system's available commands. GUIs can be made quite hard when dialogs are buried deep in a system, or moved about to different places during redesigns. Also, icons and dialog boxes are usually harder for users to script. WIMPs extensively use modes, as the meaning of all keys and clicks on specific positions on the screen are redefined all the time. 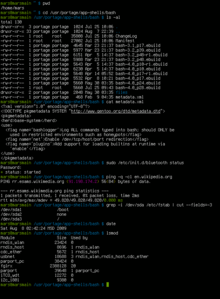 Command line interfaces use modes only in limited forms, such as for current directory and environment variables. Most modern operating systems provide both a GUI and some level of a CLI, although the GUIs usually receive more attention. The GUI is usually WIMP-based, although occasionally other metaphors surface, such as those used in Microsoft Bob, 3dwm, or File System Visualizer. Graphical user interface (GUI) wrappers find a way around the command-line interface versions (CLI) of (typically) Linux and Unix-like software applications and their text-based user interfaces or typed command labels. While command-line or text-based application allow users to run a program non-interactively, GUI wrappers atop them avoid the steep learning curve of the command-line, which requires commands to be typed on the keyboard. By starting a GUI wrapper, users can intuitively interact with, start, stop, and change its working parameters, through graphical icons and visual indicators of a desktop environment, for example. Applications may also provide both interfaces, and when they do the GUI is usually a WIMP wrapper around the command-line version. This is especially common with applications designed for Unix-like operating systems. The latter used to be implemented first because it allowed the developers to focus exclusively on their product's functionality without bothering about interface details such as designing icons and placing buttons. Designing programs this way also allows users to run the program in a shell script. This section is about 3D user interfaces as software. For physical 3D input/output devices, see 3D interaction § 3D user interfaces. For typical computer displays, three-dimensional is a misnomer—their displays are two-dimensional. Semantically, however, most graphical user interfaces use three dimensions. With height and width, they offer a third dimension of layering or stacking screen elements over one another. This may be represented visually on screen through an illusionary transparent effect, which offers the advantage that information in background windows may still be read, if not interacted with. Or the environment may simply hide the background information, possibly making the distinction apparent by drawing a drop shadow effect over it. Some environments use the methods of 3D graphics to project virtual three dimensional user interface objects onto the screen. These are often shown in use in science fiction films (see below for examples). As the processing power of computer graphics hardware increases, this becomes less of an obstacle to a smooth user experience. Three-dimensional graphics are currently mostly used in computer games, art, and computer-aided design (CAD). A three-dimensional computing environment can also be useful in other uses, like molecular graphics, aircraft design and Phase Equilibrium Calculations/Design of unit operations and chemical processes. The use of three-dimensional graphics has become increasingly common in mainstream operating systems, from creating attractive interfaces, termed eye candy, to functional purposes only possible using three dimensions. For example, user switching is represented by rotating a cube which faces are each user's workspace, and window management is represented via a Rolodex-style flipping mechanism in Windows Vista (see Windows Flip 3D). In both cases, the operating system transforms windows on-the-fly while continuing to update the content of those windows. Interfaces for the X Window System have also implemented advanced three-dimensional user interfaces through compositing window managers such as Beryl, Compiz and KWin using the AIGLX or XGL architectures, allowing use of OpenGL to animate user interactions with the desktop. Another branch in the three-dimensional desktop environment is the three-dimensional GUIs that take the desktop metaphor a step further, like the BumpTop, where users can manipulate documents and windows as if they were physical documents, with realistic movement and physics. Three-dimensional GUIs appeared in science fiction literature and films before they were technically feasible or in common use. For example; the 1993 American film Jurassic Park features Silicon Graphics' three-dimensional file manager File System Navigator, a real-life file manager for Unix operating systems. The film Minority Report has scenes of police officers using specialized 3d data systems. In prose fiction, three-dimensional user interfaces have been portrayed as immersible environments like William Gibson's Cyberspace or Neal Stephenson's Metaverse. Many futuristic imaginings of user interfaces rely heavily on object-oriented user interface (OOUI) style and especially object-oriented graphical user interface (OOGUI) style. ^ "window manager Definition". PC Magazine. Ziff Davis Publishing Holdings Inc. Retrieved 12 November 2008. ^ Greg Wilson (2006). "Off with Their HUDs! : Rethinking the Heads-Up Display in Console Game Design". Gamasutra. Retrieved February 14, 2006. ^ "GUI definition". Linux Information Project. October 1, 2004. Retrieved 12 November 2008. ^ Jakob Nielsen. "Browser and GUI Chrome". ^ Lieberman, Henry. "A Creative Programming Environment, Remixed", MIT Media Lab, Cambridge. ^ "VisiCorp Visi On". The Visi On product was apparently not intended for the home user. It was designed and priced for high end corporate workstations. The hardware it required was quite a bit for 1983. It required a minimum of 512k of ram and a hard drive (5 megs of space). ^ A Windows Retrospective, PC Magazine Jan 2009. Ziff Davis. January 2009. ^ "Magic Desk I for Commodore 64". ^ Sandberg-Diment, Erik (1984-12-25). "Value of Windowing is Questioned". The New York Times. ^ Friedman, Ted (2005). "Chapter 5: 1984". Electric Dreams: Computers in American Culture. New York University Press. ISBN 978-0-8147-2740-9. Retrieved October 6, 2011. ^ Grote, Patrick (October 29, 2006). "Review of Pirates of Silicon Valley Movie". DotJournal.com. Archived from the original on November 7, 2006. Retrieved January 24, 2014. ^ Washington Post (August 24, 1995). "With Windows 95's Debut, Microsoft Scales Heights of Hype". Washington Post. Retrieved November 8, 2013. ^ "Computers | Timeline of Computer History | Computer History Museum". www.computerhistory.org. Retrieved 2017-04-02. ^ "The iPad's victory in defining the tablet: What it means". Infoworld. 2011-07-05. ^ Hanson, Cody W. (2011-03-17). "Chapter 2: Mobile Devices in 2011". Library Technology Reports. 47 (2): 11–23. ISSN 0024-2586. ^ Graphical User Interface, (GUI) (2015-11-27). "Topological Analysis of the Gibbs Energy Function (Liquid-Liquid Equilibrium Correlation Data. Including a Thermodinamic Review and Surfaces/Tie-lines/Hessian matrix analysis)". University of Alicante (Reyes-Labarta et al. 2015-18). hdl:10045/51725. ^ Dayton, Tom. "Object-Oriented GUIs are the Future". OpenMCT Blog. Archived from the original on 10 August 2014. Retrieved 23 August 2012. Look up graphical user interface in Wiktionary, the free dictionary.